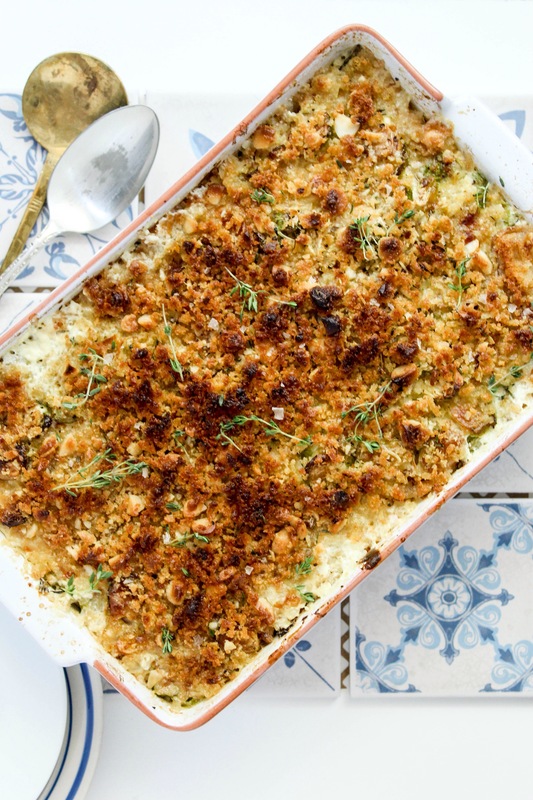 Brussels Sprout and sweet potato gratin. These days I’m leaning towards greener pastures, or so I’d like to think. I find myself wanting to eat more green, more plant food. Eating plants/vegatables has a very lacklustre underrated reputation as something of a side dish to your main meat dish. This perception can be something of the past. Lately with the help of many innovative chefs there are many restaurants or pop ups ‘hero-ing’ the humble veg placing it front and center. At the risk of lecturing, our burdened planet is taking so much strain trying to produce enough for so many and consuming red meat on a regular basis certainly doesn’t help with the on going crisis of climate change, collectively we can all make a difference, by consuming less and eating ethically reared red meat. This recipe comes straight from this month’s delicious Australia issue, a bright and interesting Jamie Oliver feature, focusing on Brussel sprouts as the ‘hero’ ingredient. Again, Brussel sprouts doesn’t exactly have the best reputation, however from what I’ve seen in this issue, there certainly are ways to make them tasty and interesting without compromising on nutrition. Preheat oven to 190 degrees C. Melt butter in a flameproof baking dish or large pan over a medium heat. Add the onion, garlic and half the thyme, and cook stirring for 8 minutes or until the onion is soft. Add the sliced potato and stir well, then pour over the milk. Bring to the boil, the reduce heat to low and simmer. Stirring constantly to release the starch from the potato slices, for 3 minutes or until the potato is heated through. Remove from the heat and stir through the cream and creme fraiche, then fold through the sliced Brussels sprouts. Add the lemon zest and half of the Parmesan. Season, and stir gently to combine, before grating over the remaining 1/2 cup of Parmesan. Place the bread in a food processor and pulse get breadcrumbs, place in a small bowl, add the chestnuts or macadamia nuts (whichever you could find or have on hand) oil and remaining thyme, and stir to combine. Sprinkle the nut crumb over the top of the vegetable mixture. Transfer to the oven and bake for 50-55 minutes or until the vegetables are soft and the top is bubbling and golden. 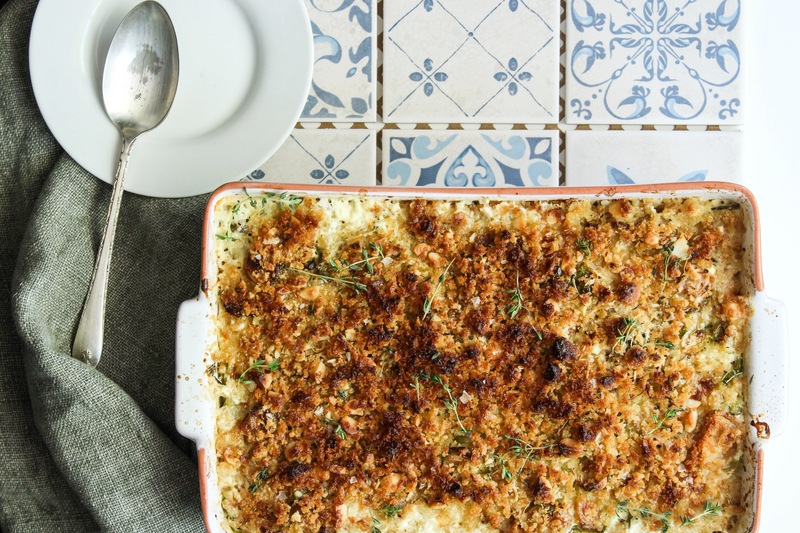 Remove the gratin from the oven and set aside for a few minutes to cool slightly, then serve with a seasonal crisp salad.